We're Still Talking About the Need for Ethics Reporting? 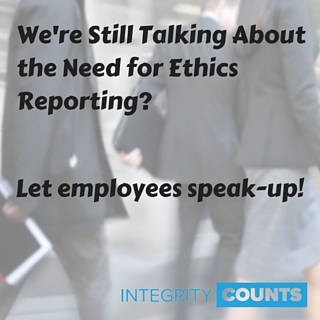 We recently jumped on the conversation arguing if employees can really speak-up with ethics reporting hotlines. In an article, the theory was was that if companies employ an ethics hotline, it’s because under normal circumstances employees can’t speak up and the use of the hotline is how the employer can get information they want / need. And again the conversation continued (here) talking about how “having an anonymous reporting system communicates to potentially abusive bosses that their employees do have a way to get help.” This supports the argument that a company may not have a safe speak-up culture so a hotline is the place to do it. The bottom line is, whether it is directly to HR, or via an anonymous system, it’s important to allow employees to speak-up about issues that could become potential disasters if left unchecked. Fraud and other misconduct costs companies more if it’s ignored. No organization is immune to unethical behaviour, and no organization can afford the costly consequences. While it is important to continue to utilize multiple fraud deterrent methods such as external audits, separation of duties, and fraud awareness training, the most important tool an organization can implement is a confidential hotline. More fraud is detected by tips than by all other means combined. A hotline is simple, provides an immediate means of communication and offers support and encouragement to employees. This is one fact that all small business owners need to be aware of. Many smaller firms do not have the means or sophistication to implement strong internal controls, so the extent of their losses can be devastating for that business. This alone makes it even more imperative for smaller operators to have a hotline set up to ensure they can gain access to information earlier to mitigate any potential losses. Public companies may be mandated to have a whistleblower system in place, and more and more non-profits are implementing these systems as a way to protect their reputation and mitigate risk, private companies who believe they don’t need these systems are setting themselves up for potential disaster. To be naive and think it won’t happen because you know your team or because everyone has worked together for a long time, is neither strategic or logical. Most fraud is conducted by long-term employees who have access to accounting, operations, sales or manufacturing departments. Private companies need to ensure they put internal controls in place. Eighteen months is a heck of a long time to continually bleed a company. It can be devastating and at times non-recoverable for many businesses. The more internal controls are in place, the more quickly fraud will be discovered. Employee training, management’s commitment to a whistleblower policy, and anti-retaliation practices are key to ensuring staff feel confident about coming forward. Because small businesses are usually focused on the day-to-day operations, strategic planning can often fall off to another day. While implementing vast internal controls is best, instituting small measures to begin with is a good place to start. Again, setting up a hotline is easy, cost-effective and an instant way to gain access to information that could save your business. Most victim organization discover their losses long after they have been spent. Studies show that the majority of business fraud does not go into investment properties or other such recoverable items, rather the perpetrators used it to support lavish lifestyle enhancements and spending, gambling or other addictions. In a nutshell – you’re not getting your money back. However you accomplish it, it’s important to allow employees to speak-up and to not ignore any complaints. Download an eBook that will help you better understand why third-party ethics reporting should be part of your internal controls.